No iPhone 5: Apple Unveils New iPhone 4S, With Voice 'Assistant' And Better Camera : The Two-Way The new phone, which has voice assistance, longer battery life and a better camera, will be launched on Oct. 14. Many of Apple's fans who had been looking forward to seeing a completely new device — the iPhone 5 — were disappointed by what many saw as an incremental improvement. 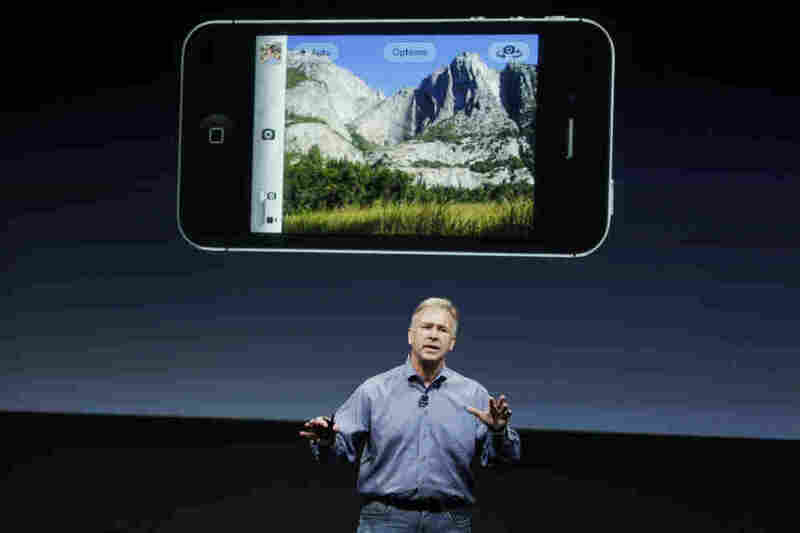 Apple Inc. has unveiled the company's updated version of the iPhone 4, called the iPhone 4S. The phone, which will be launched on Oct. 14, is very similar to the iPhone 4's styling. But it features all-new hardware inside, according to Apple. With an improved battery and software, the phone allows six hours of browsing on a 3G network, and nine hours of Wi-Fi browsing, according to Apple. And the phone also has an 8 megapixel camera with an improved sensor. The camera will reportedly allow for HD video recording in 1080p resolution, with image stabilization. Many of Apple's fans who had been looking forward to seeing a completely new device — the iPhone 5 — were disappointed by what many saw as an incremental improvement on a device that's now nearly a year and a half old. On Twitter, a user called Ouill wrote, "How do you follow up a hit product like the iPhone 4? Slap a S at the end and tell people it plays Angry Birds faster." Over at Monkey See, our colleague Linda Holmes has been following the announcement, and sifting through the rumors, suppositions — and gadget-lovers' pipe-dreams — to discuss the new phone. The new phone will come at several price levels, from $199 for a 16-gigabyte model to $399 for a 64GB version. And like the current iPhone, it will come in black and white. One new feature is the addition of more voice control and interaction, in the form of an "intelligent assistant" named Siri. The service can provide information about stocks, restaurants, and the weather, among other things. Demonstrating the feature, Apple senior VP Scott Forstall asked Siri, "Do I need a raincoat today?" — to which the phone answered, "It sure looks like rain today." The iPhone 4S will run the new iOS 5 operating software, which will be available as a free update on Oct. 12. And it will also work on both GSM and CDMA networks, making it a "world phone" that will potentially work on any carrier's network. In terms of the classic iPod, Apple CEO Tim Cook did not say whether the company has killed the device, as many rumors have speculated. Instead, he stressed how important it was. "iPod is still a large and important market for Apple. We sold 45 million iPods in the past year," Cook said, according to MG Siegler, who is live-blogging the event over at TechCrunch. "Almost half of those are going to people buying their first iPod. And many are going to people being introduced to Apple." But Cook did not discuss plans for the classic iPod — instead, he announced updated versions of the iPod Touch and iPod Nano, which is now available in 16-gigabyte ($149) and 8-gigabyte ($129) sizes. As part of the rollout of the new mobile operating system, Apple is also increasing the reach of its iCloud, the streaming service that promises to put your music and other digital content within your device's reach, no matter where you are. Cook says that iCloud will be free for users who have iOS 5 and Lion operating systems. And the service will also automatically update things like mail, contacts, and apps across several devices. Previously, the iCloud service was unavailable in Europe, largely because Apple had trouble negotiating deals with the major record labels that covered the continent. And for $24.99 a year, Apple users can have iTunes Match, which promises to scan their music collection, match songs with those already on Apple's servers, and give you access to them from the cloud. Cook also rolled out many sales statistics and news on upcoming Apple Stores in China. And he mentioned that Apple's mobile products are also a hit with businesses, saying that 92 percent of Fortune 500 companies are testing or deploying the iPad, while 93 percent of the same group has taken up the iPhone. Worldwide, Cook said, Apple has now sold some 250 million iOS devices. Massive interest in the new iPhone was frustrated by Apple's decision not to offer live-streaming video of Tuesday's announcement. As a result, fans followed the event on liveblogs — many of which began to crash from the server load.